Abracadabra - Ready to pull a festival out of a hat? 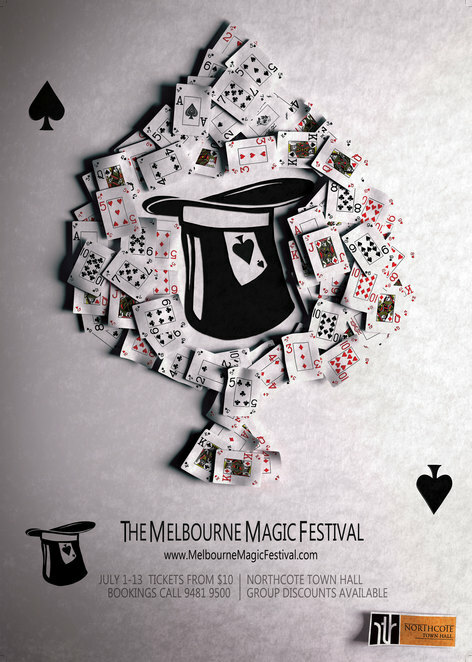 The Melbourne Magic Festival 2013 launches on June the 23rd with an Opening Extravaganza and more than a few Abracadabras! The festival returns for the sixth year to the beautiful Northcote Town Hall at 189 High Street. Festival organisers have pulled a rabbit out of their hat with an extensive program featuring 175 performances between July 1st and 13th. The international guest magician for this year is Wayne Houchin, one of the stars and hosts of the Breaking Magic show on the Discovery Channel. Adult audiences will also greatly enjoy the new story-based show from Tim Ellis In Dreams, and Nick Kesidis in his new show What's With All The Questions? A leading female magician Jo Clyne presents The Lucian Swift Chronicles. Another key highlight is The Close Up Gallery, an intimate show with a different line up of acts each night. Most tickets for shows are relatively inexpensive at around $15 to $20, but tickets on Tuesday July 2nd and 9th in Studio 3 are only $10. There are also free events such as the Move Monkeys Session, The Panel Discussion, and the Pay What It's Worth Show. The festival runs during school holidays, and offers packages for groups of 15 or more children. This can include a fun morning magic show, a magic workshop, and another fresh magic show in the afternoon. Melbourne is a city where magic-lovers can join the world of mystery and illusion, and The Melbourne Magic Festival is the ideal way for you and your family to get involved and be amazed. Why? Join the world of magic and illusion.